#stillshot is a feature in which someone selects a frame from a film, episode or campaign and discusses its content. The idea being to illustrate how the art of film composition, aesthetic and acting expression can convey the messages of entire movements and ephemeralities in a split-second. Also, ’cause there’s some pretty cool film shots out there. You might be wondering why this shot. It doesn’t look too arty, does it? But then again, does a favourite shot – or one of my favourite shots because it’s very difficult to decide, actually –have to be all that arty-farty? I don’t think it does. I quite like some neatness. Don’t get me wrong, there are many amazing art-house films out there which I really admire. It just so happened that I decided on this beautiful film shot by the great Billy Wilder. But let me give you a small overview of the story of this incredible film first. 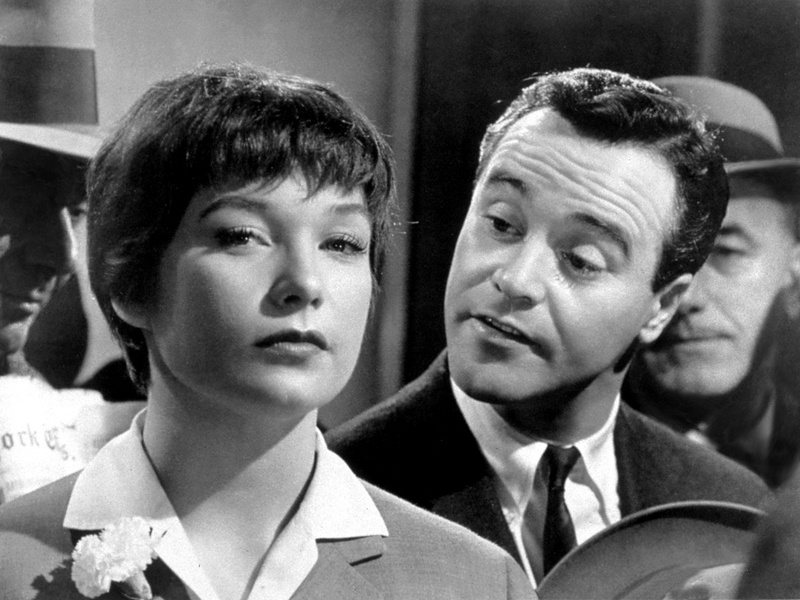 The Apartment is a classic in its own right (and I don’t say this only because I love the film). C.C. Baxter, a low-rank employee at a big insurance company in New York, lends his apartment to some executives so they can meet their mistresses. By doing this, Baxter hopes to get recommended by them to the personnel director, Mr Sheldrake, for a promotion. When his wish becomes reality, Sheldrake himself demands the keys to Baxter’s apartment to meet his own affair, the elevator girl Fran Kubelik, who Baxter is secretly in love with. The film is as much a comedy as it is a drama, and Baxter finds himself in the middle of everything and everybody. He has to step in for people he doesn’t want to step in for due to various delusions and confusions. The chosen still from the film is a wonderful shot of order and tidiness, which is later led into an evolving chaos of circumstances. I have always admired this shot. It perfectly sets the tone of the world we are thrown into and shows Baxter’s life – and work-style right from the start. He is just a small fish in a huge pond and struggles not to be eaten by the overall system. He is there to work. That is his main focus in life at the beginning of the film. Every office table looks the same, even the structure of the ceiling and the office lights fit perfectly with the arrangement of the tables on the floor. Every detail is symmetrical, which goes hand in hand with the central perspective of the whole shot. Every employee wears a similar outfit. Men are all wearing suits with a tie while the women wear either high-necked dresses or tops. The only thing that might not be symmetrical is the number of wandering people on each side, which doesn’t unbalance the picture at all but stabilises it instead. 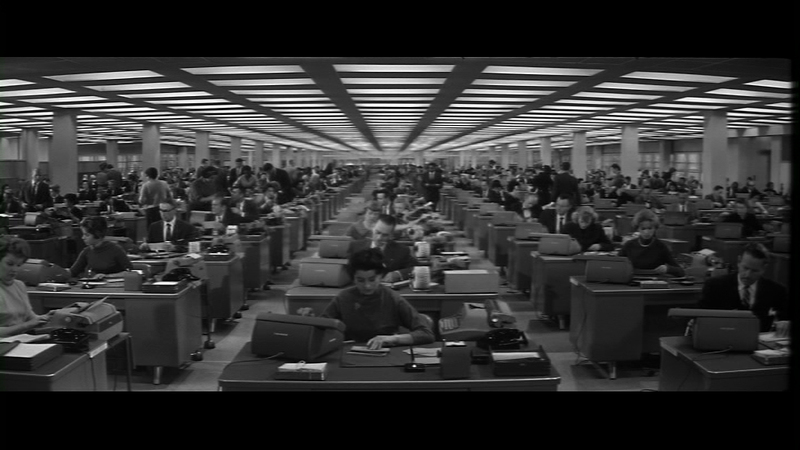 The fact that The Apartment was shot in black and white adds even more drabness to Baxter’s situation in this shot, but it also gives the overall film this special charm of the 1950s and ‘60s movies, in my opinion. The film combines so many components, from laughter, to sadness and tears, to confusions and comprehensions; everything packed into 125 minutes and you just want to watch the film over and over again. But the most incredible thing for me about this film is that its story is universal and very well adaptable to our times nowadays as it was back then. We are all struggling to get attention and be noticed in this vast pool of people – by tweeting and Facebooking and what not. Everybody would like to get a piece of the pie but of course, we all have to pay our price for that. The Apartment is and will always be a pure classic! Sarah Eke is a short film director currently based in London. Originally from Germany, she fulfils all the stereotypes of her home country: she loves Bratwurst and Sauerkraut more than anything else, is narrow-minded and doesn’t have any humour at all. She also possesses se lovely German accent. I read this article and found it very interesting, thought it might be something for you. The article is called The Apartment – #stillshot and is located at http://prancingthroughlife.com/2014/06/19/the-apartment-stillshot/.